Chips and salsa are a favorite at our house, and every once in awhile I make homemade tortilla chips. 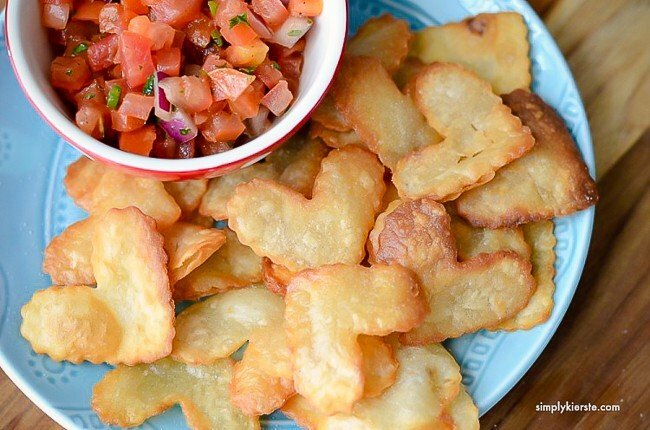 They’re always a huge hit, so I knew that my kids would love this fun Valentine’s Day snack of Heart Chips & Salsa! Aren’t they adorable? And they taste SO yummy! My kids gobbled them up and were asking for more within minutes. I guess next time I’ll have to do a much bigger batch! If you’ve never made homemade tortilla chips before, I’ll tell you, they’re worth it. They don’t take long to make, and they taste divine. Usually I use a pizza cutter to cut corn tortillas into pie-shaped triangles, but in honor of Valentine’s Day, I used a heart cookie cutter (about 2 inches) instead. While I cut out the hearts, I heated canola oil in a deep saucepan. I used tongs to lower a few hearts at a time into the oil (don’t overcrowd–they won’t cook as well), and then flip them them when they were light to golden brown on one side. Once they browned on the other side, I removed them with the tongs and placed them on a plate covered in paper towels, and sprinkled salt on top. I also fried the remnants tortillas that I cut the hearts out of, so I didn’t waste anything. They were cute too–with the heart openings! The whole process is pretty fast, and the chips fry quickly because they’re so thin and small. BE VERY CAREFUL when working with hot oil, and keep children away. 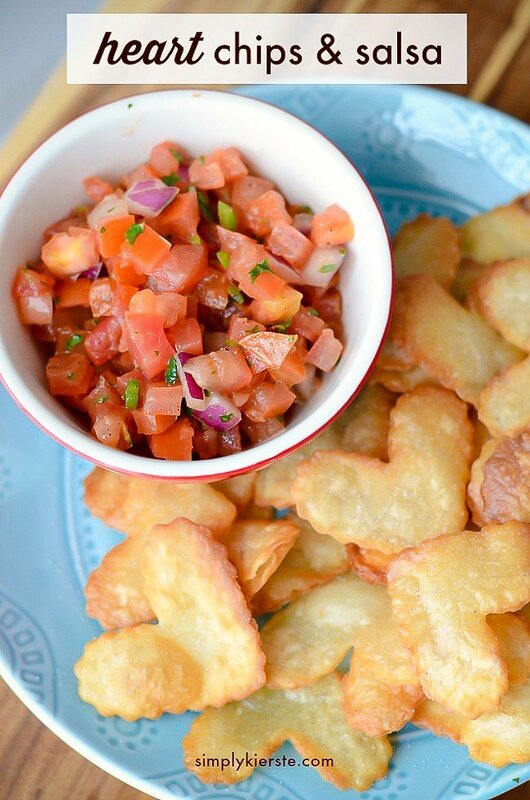 These would make a perfect Valentine’s Day snack or appetizer, perfect for your family or serving at parties! You could also skip the salsa and serve them with a Taco Soup, on top of a Chicken Tortilla Soup, or with Chili.